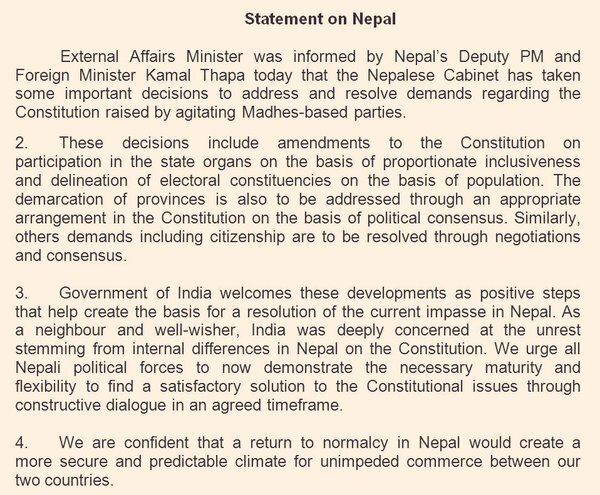 Nepal has accepted the plea of Indian Govt and other Madhesi people who are a part of the country. Madhesis was given less right in the newly formed constitution of the country. As as result, many from ‘victimised’ community joined the protest against the existing govt and breaks out almost every move. India also stopped the supply of necessities to the Nepal for making them for this proposal. The two demands of the Madhesi people includes regarding proportional representation and constituency delimitation. After these amendments, there is a ray of hope among many Nepali citizens for starting a normal living once again. Despite being a separate country, many of the Nepalese cultures are similar to India. The emergency cabinet meeting was being called by the members of parliament to discuss this issue at Singha Durbar. Solutions were recommended regarding the disputes on provincial boundaries. The agitating Madhes-based parties in Nepal have been protesting for over four months versus the seven-province design proposed in the newly formed Constitution that breaks their inherited land as a way to politically marginalise them. Around 40-50 people were killed in the protests on the issue. Finally, the govt decided to address the issues keeping on reminding the arrival of winters. They have blockaded Nepal’s border trade points with India, causing a shortage of essential goods and medicines in the landlocked country. At least 50 people have been killed in protests by Indian-origin Madhesis since August. Madhesis, who reside in Terai region, constitute nearly 52 per cent of Nepal’s population. The meeting decided to move forward with the bill to amend the new Constitution which has already been tabled in parliament. “The bill has ensured proportional inclusive participation in various state organs as demanded by the agitating parties and has also proposed delimitation of the electoral constituencies based on population,” Minister for Industry Som Prasad Pandey told reporters after the meeting.